Environmental Protection Agency Administrator Scott Pruitt, under scrutiny for lavish spending and alleged ethics violations, resigned on Thursday, July 5. Environmentalists and lawmakers from both parties welcomed the resignation Thursday of EPA Administrator Scott Pruitt, saying it was an overdue move by an official who sought to undermine the mission of the agency he headed. Calls for his resignation had come from some Republican lawmakers including Pennsylvania’s Brian Fitzpatrick who said last week there were too many allegations against Pruitt for him to avoid the usual process of investigating public officials who are accused of unethical conduct, and who urged Pruitt him to step down immediately. Pruitt’s resignation letter cited the “unrelenting attacks” against him as the reason he resigned. In May, Fitzpatrick accused Pruitt of trying to suppress the release of a federal report on the health risks of PFAS, a class of chemicals that has been linked to cancer and other illnesses, because the report – which was later released — recommended tighter health limits on the chemicals than the EPA did. In this file photo from January, Scott Pruitt, President-elect Donald Trump’s nominee to run the Environmental Protection Agency, testifies at his confirmation hearing before the Senate Environment and Public Works Committee on Capitol Hill in Washington, Wednesday, Jan. 18, 2017. Fitzpatrick, who faces a challenge from Democrat Scott Wallace for his 1st District seat in the November elections, has called for stricter federal limits on the chemicals, which have been found at high levels in the water of his Bucks County district. In a statement Thursday, Fitzpatrick welcomed Pruitt’s resignation, and said his handling of the PFAS issue was motivated by politics. The congressman said he hoped Andrew Wheeler, now the EPA’s acting administrator, will be more willing to eliminate the chemicals from drinking water. “I will closely monitor the EPA’s progress on their PFAS initiative as the agency transitions to new leadership,” Fitzpatrick said. Conservatives in the Trump administration defended Pruitt as a champion of deregulation and a destroyer of President Barack Obama’s environmental policies such as the Clean Power Plan. But they were finally unable to resist the pressure from 13 investigations into Pruitt’s management of the agency. President Trump himself praised Pruitt in a tweet even as he accepted the resignation. “Within the agency, Scott has done an outstanding job and I will always be thankful to him for this,” he wrote. In Philadelphia, a trade union leader representing EPA workers said he hopes Pruitt’s resignation will help to restore the agency’s reputation. “If it can lead to some normalcy, and also America having confidence in the Environmental Protection Agency and its employees to carry out our mission to protect human health and the environment, then this is a change that was necessary,” said Gary Morton, president of American Federation of Government Employees local 3631, which has about 675 EPA members in the region. But he worries about who Trump will appoint as Pruitt’s successor. “I’m very concerned that the administration will not provide EPA with the tools necessary to protect human health and environment and then in turn give us a failing grade when they haven’t given us a fair chance,” Morton said. Morton says Trump administration policies like rolling back the Clean Water Rule and the lavish spending hurt staff morale at the agency. 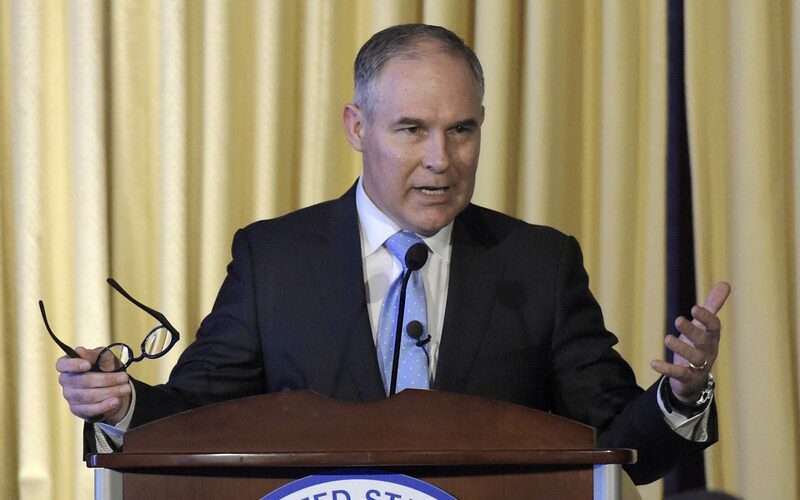 Environmental Working Group, a research and advocacy group on PFAS and other environmental issues, called Pruitt the worst leader in the EPA’s history. But EWG said it doesn’t expect Wheeler, a former coal industry lobbyist, to make PFAS regulation any more likely. Pruitt faced pressure to resign amid allegations including installing a $43,000 soundproof booth in his office, and accepting a Washington apartment for minimal rent from the wife of an energy lobbyist, according to published reports. Delaware Sen. Tom Carper, the top Democrat on the Senate Environment and Public Works Committee, said Pruitt had sought to erode environmental protections, questioned sound science, and profited personally from his position. “For seventeen months now, we have had an individual leading the Environmental Protection Agency who is openly hostile to the agency’s fundamental mission, a self-described leading advocate against EPA’s ‘activist agenda’ who has made a mockery of the position of administrator,” Carper said in a statement. Earthjustice, an environmental law group, accused Pruitt of favoring industry in his actions as EPA administrator, and of personally enriching himself through his position. “His departure should be welcome news to anybody who values clean air and water,” the group said.